Professor Kenkichi Iwasawa passed away on October 26th, 1998. The following article was written for an issue of the popular Japanese magazine Sugaku no Tanoshimi (Pleasure of Mathematics). I still remember very clearly the first time that I met Professor Iwasawa. It was in 1967 when he had just become a faculty member at Princeton University. I was a second year graduate student and had decided that I was ready to take the General Examination. Students were not told in advance which faculty members were to be on their examining committee. I had hoped that Professor Iwasawa would be on my committee and, on the day of the examination, when I was told that the committee was waiting for me in his office, I knew that my hope would be fulfilled. It was at that time that I first met him. About a week after my General Examination, I came to Professor Iwasawa's office again to ask him if I could become his Ph.D. student. I felt rather nervous because, although I did fairly well in most of the examination, my answer to one of his questions about Algebraic Number Theory was rather poor. But nevertheless he did say yes, and I then began to study what was referred to at that time as the theory of Gamma-extensions. Iwasawa had introduced some of the basic ideas of that theory just eleven years earlier. His first lecture about the subject was at the summer meeting of the American Mathematical Society in 1956, which took place in Seattle, Washington. Just a few years after that lecture, the French mathematician Jean-Pierre Serre gave an exposition of Iwasawa's theory at the Seminaire Bourbaki in Paris. By the time that I became his student, Professor Iwasawa had developed his ideas considerably. The theory had become richer, and at the same time, more mysterious. Even though only a few mathematicians had studied the theory thoroughly at that time, there was a general feeling that the theory was very promising. When I look back at the developments that have taken place in the past three decades, that promise has been fulfilled even beyond expectations. Since the beginning of the 20th century, one of the continuing themes which motivated Algebraic Number Theory was the analogy between algebraic number fields and algebraic function fields. This theme was behind the work of many great number theorists. I believe that one reason that Iwasawa's theory of Gamma-extensions seemed so promising was that it suggested a much deeper aspect of this analogy. It was already clear in some of Iwasawa's first papers on the topic that this analogy was very much in his mind, and by the late 1960s, he was able to formulate a very remarkable conjecture which pushed this analogy much further. In the theory of algebraic function fields, one of the famous and important theorems, which was discovered by Andre Weil in the 1940s, states that there is a very precise relationship between the zeta function and the divisor class group of an algebraic function field. It was undoubtedly hard to imagine how to even formulate an analogous result for algebraic number fields, but Iwasawa's theory provided exactly the right framework to make that possible. Iwasawa's Conjecture asserts that there should be a precise relationship between two analogous objects associated with a large class of algebraic number fields: the "p-adic zeta function" which had recently been invented by Tomio Kubota and Heinrich Leopoldt and the "Iwasawa Module" which was constructed from ideal class groups. In the 1970s, this conjecture came to be called "Iwasawa's Main Conjecture." It was a tradition at Princeton to have tea every afternoon in Fine Hall. This provided one of the best opportunities for graduate students to informally discuss mathematics with their professors. Professor Iwasawa usually came to the afternoon teas. It was then that he often suggested problems for me to think about and every few weeks he would ask me if I had made any progress on some of these problems. I recall that these problems seemed quite hard, but sometimes I was able to report some real progress, and then we would go to his office so that he could hear what I had done. He would help me push some of my ideas forward, but it was quite clear that he wanted me to accomplish as much as I could on my own. I often had the feeling that he was purposely not revealing everything that he knew about a specific problem. Professor Iwasawa also advised me to avoid the natural tendency of trying to read everything that was written about related topics before tackling some of my research problems. His philosophy was that one might then have a much better chance of coming up with a really novel and fresh approach. I tried to follow his advice to some extent, but I must admit that I did read Iwasawa's own papers quite thoroughly. Professor Iwasawa's courses at Princeton were very popular among the graduate students. Visitors at the Institute for Advanced Study would also attend. His lectures were very beautiful, clear, and perfectly organized. But, remarkably, he lectured entirely without lecture notes. I remember only one exception to that, when once he briefly glanced at a small paper which he pulled from his pocket, put it back, and then continued his lecture. During the year 1968-69, Professor Iwasawa gave an introductory course on the theory of Gamma-extensions. I took very careful notes from that courses which, for years afterwards, were quite in demand and circulated widely. In the early 1970s, various mathematicians began to realize that Iwasawa's ideas had some important implications for other parts of number theory. Barry Mazur was inspired by these ideas to develop an analogous theory for elliptic curves, including a version of Iwasawa's Main Conjecture in that context. On the one hand, Mazur constructed an Iwasawa Module which reflected algebraic properties of the elliptic curve. And on the other hand, Mazur, together with Swinnerton-Dyer, discovered that they could construct a natural p-adic L-function which reflected properties of the classical L-function for the elliptic curve defined by Hasse and Weil decades earlier. Mazur realized that this version of the Main Conjecture provided an approach to studying the famous Conjecture of Birch and Swinnerton-Dyer concerning elliptic curves. At about the same time, John Tate realized that some of Iwasawa's results and techniques could be applied to some basic questions in Algebraic K-Theory for number fields. These ideas were then pursued systematically by John Coates and Steven Lichtenbaum. But one of the most dramatic developments was the Theorem of Coates and Wiles proved in 1977. This was the first truly general result concerning the Birch and Swinnerton-Dyer Conjecture. The essence of their proof was to adapt a very deep theorem of Iwasawa concerning the Gamma-extension constructed from roots of unity to another Gamma-extension which could be constructed from certain elliptic curves. It was an exciting demonstration of the power of Iwasawa's Theory. These developments of course attracted many mathematicians to start working on different aspects of Iwasawa Theory and important breakthroughs occurred every few years. 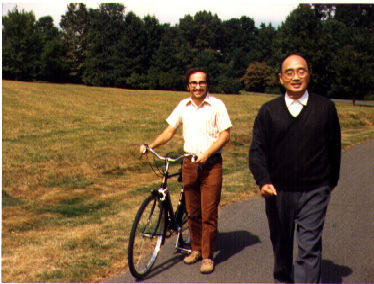 Bruce Ferrero and Larry Washington proved one of Iwasawa's earliest conjectures in 1978. Andrew Wiles and Barry Mazur succeeded in proving Iwasawa's Main Conjecture in 1983. But even as these results were proved, it came to be realized that the Main Conjecture and some of the other conjectures could be formulated in a vastly more general context. For me personally, it has been a great privilege to watch how fruitful Iwasawa's original ideas have been, how they have blossomed over the years, and to have contributed along with other mathematicians to their development. Certainly, there are now several hundred research papers in the mathematical literature on different aspects of Iwasawa Theory. It has become one of the fundamental branches of modern number theory. I visited Professor Iwasawa in Princeton rather often after completing my graduate studies. I have very fond memories of those visits. Professor and Mrs. Iwasawa would welcome me at their front door. Then Professor Iwasawa and myself would sit in the living room and chat about a great variety of things for a couple of hours. Mrs. Iwasawa would bring tea and various sweets, sometimes traditional Japanese pastries, sometimes American-style deserts. Often, their beautiful dog Zeta would come into the room, but just to stay briefly. I missed those visits after their return to Japan, but a number of years later I did have the opportunity to visit them in Japan. Those visits are cherished memories for me.